We all know that getting too much added sugar carries a slew of health risks—from weight gain and heart disease to diabetes and obesity-linked cancers. In fact, research shows that most Americans are getting so much sugar in their daily diets that they are increasing their heart attack risk by 20%. But with so many natural and artificial sweeteners to choose from—and new studies coming out all the time that raise questions about their safety—it’s tough to know which claims are valid and which are not. If you’re not cutting calories and eat a healthful diet, it’s OK to have up to two to three teaspoons of these sugars daily. But if your diet includes high-sugar snacks, cereals, drinks or other processed foods, limit these sugars to a few times a week. Brown and white sugars. You may think of brown sugar as a more wholesome choice than white sugar. But the fact is, they’re both processed—white sugar is derived from sugarcane or sugar beets, while brown sugar is a combination of white sugar and molasses. These sugars also have roughly the same number of calories—16 calories per teaspoon for white sugar…and 17 for brown sugar. How safe? 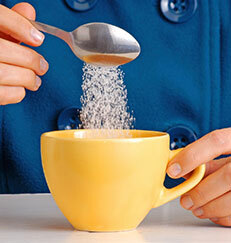 When consumed in modest amounts, brown and white sugars are safe for most individuals. Brown sugar is really no more healthful than white sugar, but it does make baked goods moister and adds a hint of caramel flavor. Follow your taste preference. Honey. Even though honey contains trace amounts of minerals (mainly potassium, calcium and phosphorus), its nutritional value is not significantly different from that of white or brown sugar. Honey is about 25% to 50% sweeter by weight than sugar, so you can use less and still get a nice sweet taste. How safe? Honey is safe for most adults when consumed in modest amounts. However, honey should never be given to babies under one year of age—it could contain bacterial spores that produce a toxin that causes infant botulism, a serious form of food poisoning. Honey’s stickiness also may contribute to cavities in everyone else. Agave (ah-GAH-vay) nectar. Made from the juice of the agave plant, this sweetener reminds some people of a sweeter, thinner version of honey. Agave and honey have about the same number of calories (21 calories per teaspoon). How safe? Overall, agave is no more healthful than other types of added sugar. Compared with the same amount of white sugar, agave causes smaller increases in blood sugar, triggering fewer of the metabolic changes that can lead to diabetes and heart disease. However, agave is higher in fructose than other natural sugars, which may not be healthy in large amounts. Molasses. This syrupy liquid is created from the juice of sugarcane and beet sugar during the refining process. The type of molasses is determined by the degree of boiling that occurs—light molasses comes from the first boiling…dark molasses, which is darker and thicker than the light variety, comes from the second boiling…and blackstrap molasses, which is quite thick and dark, comes from the third boiling. How safe? Molasses is safe for most people. Dark and blackstrap molasses provide health-protective polyphenol compounds. Blackstrap molasses is also a good source of iron. All types of molasses contain about 20 calories per teaspoon. Aspartame. Sold in a light blue packet as NutraSweet or Equal, this artificial sweetener has no calories and is about 200 times sweeter by weight than white or brown sugar. Aspartame is used in soft drinks, chewing gum, pudding and gelatins and hundreds of other products. How safe? Some individuals get headaches and/or feel dizzy when they ingest too much aspartame. Despite animal studies that have linked aspartame to cancer, no such association has been found in humans. However, a recent study linked consumption of diet soft drinks containing aspartame to an increased risk for non-Hodgkin’s lymphoma and multiple myeloma in men. The watchdog group Center for Science in the Public Interest (CSPI) advises against using aspartame. In addition, people with phenylketonuria should avoid aspartame completely—this genetic disorder makes it difficult to metabolize phenylalanine, one of the protein building blocks used to make the sweetener. Saccharin. Found in a pink packet and sold as Sweet’N Low, it is 300 to 500 times sweeter than sugar. Saccharin has less than four calories per packet. How safe? Despite concerns about saccharin causing bladder cancer in male rats, many human studies have shown no link to cancer risk. Even so, CSPI believes the research is inconsistent and recommends against its use. There’s some evidence that saccharin can cross the placenta, so some experts advise women to limit it during pregnancy. Stevia. A highly purified extract made from the leaves of a South American shrub, stevia (sold as stevia, rebiana and under the brand names PureVia and Truvia) has zero calories and is about 250 times sweeter than sugar. How safe? No health risks have been uncovered in a wide range of studies on stevia, but research is ongoing. Stevia may cause an allergic reaction in people who are allergic to ragweed and could interact with diabetes and blood pressure drugs. Sucralose. Known as Splenda and sold in a yellow packet, it has four calories per packet and tastes about 600 times sweeter than white or brown sugar. Sucralose is a processed sweetener derived from a molecule of sucrose (table sugar). How safe? There’s noevidence that sucralose harms humans when consumed in small amounts. One recent study suggested that it increases diabetes risk, but this was a small study of obese people looking at how sucralose affected their ability to metabolize a very large sugar load—about 19 teaspoons consumed all at once. More research is needed on how sucralose may affect metabolism with a more typical diet. High fructose corn syrup (HFCS). Derived from cornstarch, HFCS is found in a vast and sometimes surprising array of processed foods, ranging from many breads and yogurts to certain brands of applesauce and even macaroni and cheese. Beverages that contain HFCS include a wide variety of soft drinks, sports drinks and even tonic water. How safe? Most experts have long insisted that there’s no research showing that HFCS is any worse than other sweeteners—and, in fact, most HFCS contains only a little more fructose than regular table sugar. However, some studies have now linked HFCS-containing beverages (one or more servings a day) to greater risk for heart disease, diabetes, weight gain and obesity. But these associations may be due to increased calorie consumption from foods that contain HFCS, such as soda, rather than the HFCS itself. Best: Avoid these beverages and limit processed foods to substantially cut consumption of HFCS and calories. Sugar alcohols. Sorbitol, mannitol and erythritol are processed sweeteners that do not actually contain alcohol or sugar. They’re about half as sweet as white sugar, with fewer calories. Sugar alcohols are slowly absorbed, so they don’t raise blood sugar quickly. A serving of food with less than 5 g of these sweeteners generally will not affect blood sugar. Consuming more than 20 g at once can lead to gas, bloating and diarrhea. *People with diabetes can use any type of sweetener in their diets but must include it in their total daily carbohydrate limit recommended by their doctors or registered dietitians. Artificial sweeteners themselves have no carbohydrates, but the foods containing them usually do. To cook or bake with artificial sweeteners, check the labels for instructions. Source: Karen Collins, RDN, a registered dietitian nutritionist, speaker and consultant, and nutrition adviser to the Washington, DC–based American Institute for Cancer Research, AICR.org. She is the author of the weekly syndicated newspaper column “AICR HealthTalk” and blogs at KarenCollinsNutrition.com/smartbytes. She has taught patients how to cut down on sugar for more than 25 years.